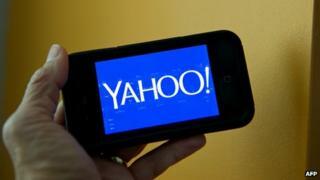 Yahoo has announced two original TV series that will be shown on its website and mobile app. It makes Yahoo the latest technology firm to join the fast-growing market for digital video content. On Monday, Netflix announced a deal with Verizon - one of the biggest internet service providers in the US - which will see Netflix servers connected directly to Verizon's network, resulting in faster speeds. "We have reached an interconnect arrangement with Verizon that we hope will improve performance for our joint customers over the coming months," Joris Evers, spokesman for Netflix, said in a statement. The firm had agreed a similar deal with Comcast earlier this year. Yahoo said its first two original series will be comedies titled: Other Space and Sin City Saints. The firm said it has got 500 million streams on Yahoo Screen in the US since it launched its comedy line up on the website seven months ago. "We are continuing to build our library with universally loved comedy such as Saturday Night Live and Comedy Central," Kathy Savitt, chief marketing officer on Yahoo, said in a statement. Earlier this month, Amazon agreed a deal with HBO that will allow US customers of its streaming service, Amazon Prime, to watch HBO's TV shows, including The Sopranos. Amazon Instant Video has also announced a series called The After - a post-apocalyptic drama by X-files creator Chris Carter - among other commissions. Meanwhile, Microsoft is expected to launch two sci-fi series - Halo and Humans - on its Xbox Live service over the coming months. Could new net neutrality rules fuel piracy?